After a lot of posts about android, like how to install android x86 on pc/laptop but this time I'm posting a different than ever before for this blog :). Hard drive is one of the most important parts of a computer without it the computer couldn't get into windows or any other operating system. This post is a continuation of the last post is how to fix a damaged hard drive or bad sectors and there is given a way to overcome the bad sector affected hard drive, but there are bad sectors hard drive is not physically damaged. 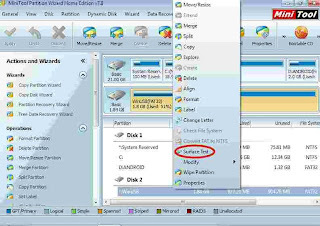 This post different from the last post because here only gives quick tips on how to separate or cutting partition hdd (hard drive) are affected bad sectors and not repair bad sectors, so once we know the hard drive that has damaged some bad sectors on the hard drive may be can fix with some free software that can be used with well. But if bad sectors already penetrated into all partitions/blocks/sectors then it is small change to be overcome, and usually the hard drive has been sounded loudly. One more thing if the hard drive is not detected by the computer try to replace into other power supply or plug it into another computer, if the same result it's mean the hard drive is dead cannot be fixed. First things advance check the hard disk bad sector affected by the application instance with Minitool Partition Wizard. And the following is only an example and I use the hard drive is still good and no bad sectors but these are simply examples. 1. Download and install Minitool Partition Wizard here. 2. Once install it to the windows os and open the Minitool partition wizard and point to your mouse on the hard drive we will check the existence of the damaged sector. 3. Once we select the hard drive, right click on the mouse and select "Surface Test" to start checking for bad sectors wait until the check is finish. 4. The result will be to know before and after a hard drive on a check , if the color of the little boxes all the green , then the hdd ( hard drive ) there are no bad sectors or no block sector has been corrupted, and if the small box is red then it is block or sector is damaged . After we check and find out the block sector has been corrupted then the next step is to separate partition bad sectors and should not be used in a way that damaged sector block, and even if bad sectors the disk is not too severe then we can use this step. Before we separate the bad sectors in affected partition we can use the other repair bad sector disk apps to recover/repair such as hdd regenerator or other tools recovered, and if it is not able to recover in the best way is to separate or cutting the blocks sectors are damaged. Following ways is a short but solid tips but block the damaged sector we do not know how MB/GB but here I use a feeling or a percentage of the hard drive. 1. Once scanned and checked for bad sectors and it is not too much then the next step on the way to unformat/unallocated partition the bad sectors affected. 2. Move/resize of size the partition and create a new partition for example if the disk is 2 gb and bad sectors are at the beginning of the partition such as in the picture above. 3. Cut that was the beginning of the partition by right-clicking the mouse on the minitool partition wizard and move/resize partitions as about 200 MB at the beginning of the affected or contained some bad sectors. - Drag the mouse left click to start separating the affected partition bad sectors to the right . 4. Once cut into two parts so that 2GB partition in pieces 200MB so the harddrive become 1.8 GB and the remaining 200MB, scan again or check back with "Surface Tests" if it is contained bad sectors. 5. If there are bad sectors on the new partition 1.8 GB and start cutting back the partition to approximate how many MB to be cut in this way is to use move/resize option on minitool partition wizard and so on until the bad sector is completely absolutely nothing in the new partition. 6. The new partition in bad sector affected must be to unformat or unallocated which means we don't use that partition so it does not interfere with the performance of other partitions. Here's an example of the hard drive is a lot of bad sectornya so many separate partitions as shown below, indicates unalocated partition is not used because there are bad sectors . But if bad sectors are in the middle of the 2GB partition? cut into two parts for example if the disk is 2 GB Move/Resize in the middle 1GB and 1 gb check back with "Surface Test" and find the bad sector and use the step above. The example above is not from the hard drive really bad sectors but it is just an example of how to separate the bad sector is like the example above. And I have tried to my hard disk with bad sector affected and can be quite successful. I am so confused to how to explain it but hopefully my this post is understandable :). Is it possible to merge those partition with good sector? It's not hard to separate damaged areas. But i think it's impossible to marge the other (healthy) areas and use them as one partition. Interestingly, you can marge two-or-more physical HDDs via creating "Spanned Volume", but you can't do the same thing on partitions.